A DC District Attorney: Our Very Own Jack McCoy? 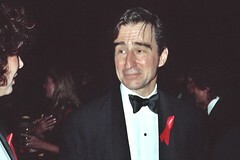 The best thing I’ve ever heard about Law & Order’s DA Jack McCoy is, “Jack McCoy would eat a baby if that’s what Justice demanded of him.” McCoy would likely also put himself on trial for the eating of the baby, and he’d get the death penalty. It would be an awesome episode. Today Congresswoman Norton introduced the District of Columbia District Attorney Establishment Act of 2009 to the House, which would provide for an extension of the Home Rule Act that would permit the city’s top prosecutor to be an elected position. In November of 2002, the city put a referendum on the ballot concerning the election of a District Attorney that passed overwhelmingly, however extension of the Home Rule Act is the purview of Congress, and would also require the signature of the President. Personally, I kinda liked Adam Schiff, but as he’s retired, I think we might just have to find our own Jack McCoy.